Hitomi took up ceramics in 1995 when she joined a pottery class in her home town of Yamaguchi, Japan. She was so excited by the experience that she asked her uncle to make her a potter’s wheel using the motor of an old washing machine. It worked so well that she didn’t need to buy a new one until 2002! By then, she had a small electric kiln to fire her ceramics at home, using glazes from different kinds of wood ash which she collected herself. Hitomi took another course in ceramics in Australia, and in 1999 visited potters in Canada, including Gary Chernoff. 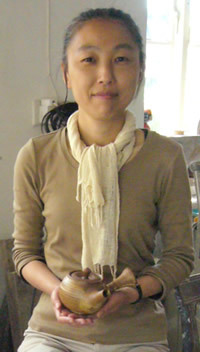 Hitomi studied at the Yamaguchi College of Arts and has been tutored by Ms.Tomoko Yokoyama. She first visited Ray Gridley’s studio in 2004, returning in 2006 and 2007 to work and study. She produces delicate and precise pieces, combining Japanese traditional styles with robust and unusual glazes. She has been influenced by potters from around the world but maintains a totally unique style.